The CHOZEN AWARDS is back, but first we're launching something new! You are especially invited to join us for Atlanta's first ever crowd-sourced, micro-grant giving dinner. 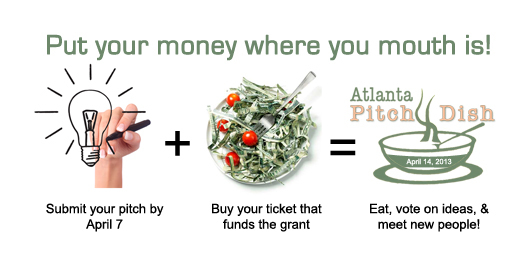 Atlanta Pitch Dish is a grassroots grant-funding community meal for small to medium sized creative projects. Here's how it works: A group of imaginative people come together to share a meal, hear ideas and fund the one they believe in most. There's a $10 charge for dinner with $7 of each meal awarded to the grant winner while the remaining $3 goes to fund the CHOZEN AWARDS Scholarship. Everyone who purchases the meal gets one vote to determine who will receive the grant. The are no real rules. The only parameter is that each project shows how it will benefit the Greater Atlanta community. 4 grant seekers will be given 4 minutes to make their pitch followed by 4 questions from the diners. What kind of pitches can you expect? Authors, Designers, Educators, Environmentalist, Filmmakers, Hackers, Health Enthusiasts, Mentors, Musicians, Non-Profits, Photographers, Start-ups, Social Entrepreneurs, Visual Artists… Anyone with an idea can share how their project can use $500 - $900 to make an impact. 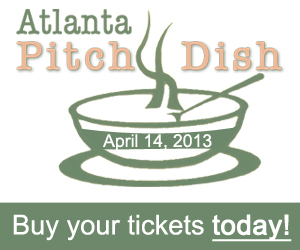 Want to Get Involved with Atlanta Pitch Dish?